According to Shaf-Brener, Gedalia Abramovich was a widower. He had a son, Ben Tsion, who was married to Feiga. The couple had a daughter, Chaya. Gita Abramovich was a widow. Shaf-Brener does not indicate how Gita was related to the rest of the family. Gedalia Abramovich produced shoes in the Old Town (Kehilat Shkud 52). All together, the factories and craftsmen in the trade produced around 400 pairs of shoes a day. 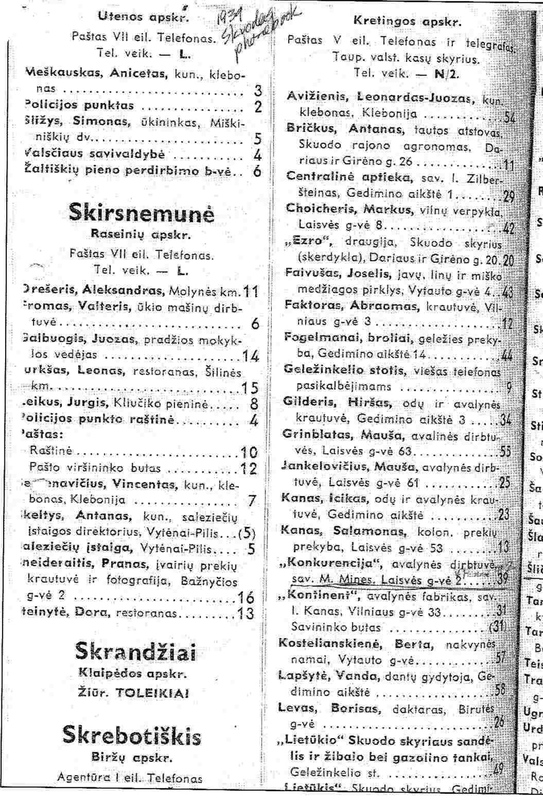 (Kehilat Shkud 13). Chaim Shalom Abramovich (relationship to the rest of the family uncler) emigrated to France. 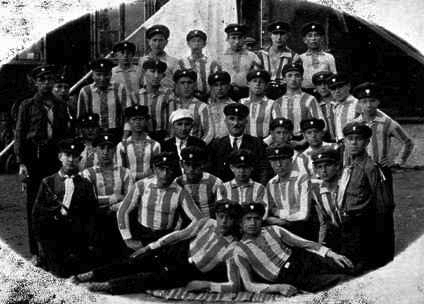 He was a member of Shkud’s Macabi football team. Daniel Abramovich (relation to rest of the family unclear) emigrated to the US. He was a member of Shkud’s Hashomer Hatzair troop. Bottom row (right to left): Moshe Kangisser (now in South Africa), Jacob Kravitz, Meir Sheindling, Hirt Tov (now in Rhodesia), David Gruppel (now in Israel), Yosef Taitz, Moshe Falk, Chaim Elkin. 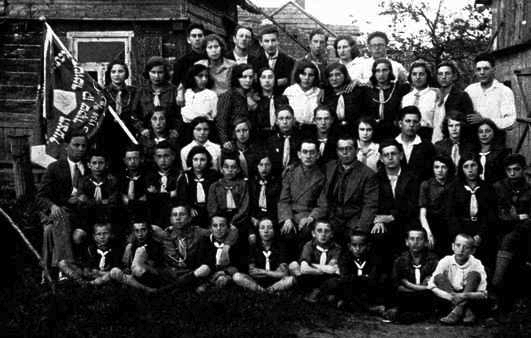 Second row: Yosef Peltz (now in Israel), Tzipa Sher, Perlgeber, Meir Hovsha, Daniel Prochovnik Pirchiyahu (now in Israel), Alexander Pinta (now in Israel), Gitta Taitz, Zalman Gruppel (now in Israel), Miriam Tov, Eliyahu Fogelman (now in the USSR), David Peltz, Chaim Urdang, Eliezer Bob. Third row: Sarah Belkind (now in Lithuania), Gelle Perlgeber, Shalom Binder, Feige Perlgeber, Shlomo Yankelovitz, Meir Taitz, Chaya Peltz Yaakobi (now in Israel), Tzipora Taitz Freilichman (now in Israel), Tzipa Singer. Roza Abramovics nee Iudelmark was born in Shkud, Lithuania in 1888. She was a housewife and married to Khaim. Prior to WWII she lived in Liepaja, Latvia. During the war she was in Libau, Latvia. 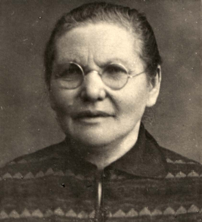 Roza was murdered in 1941 in Libau, Latvia at the age of 53. This information is based on a Page of Testimony (displayed on left) submitted by her daughter. For more information on the Abramovich family in Skuodas, search on JewishGen: http://www.jewishgen.org/.